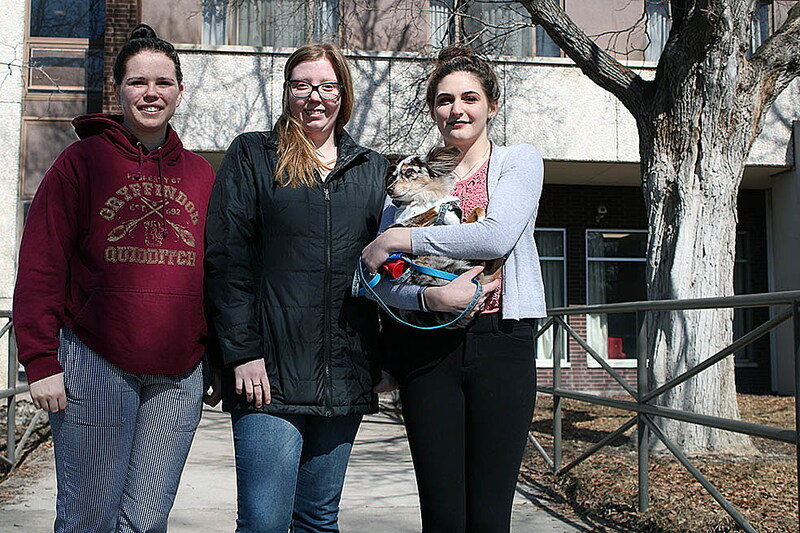 Taylor Larson, Haley Corbeill and Lauren Brittain are spending their freshman year at the University of Montana on campus in Jesse Hall, but already have signed a lease to move downtown to the new privately owned ROAM apartments for next school year. Larson is studying culinary arts, and ROAM’s large courtyard and outdoor seating was one amenity she liked. “I love the courtyard because it’s an open space and there are grills out there that you can use to cook, which is what I love to do,” she said. In general, the group agreed that proximity to campus and a gym were important, along with an in-unit washer and dryer and the option of keeping a pet. The rent is also affordable. “What we pay in a semester if you divide that between the months in each semester, it’s only about $10 more at ROAM, so it’s very affordable,” Brittain said. 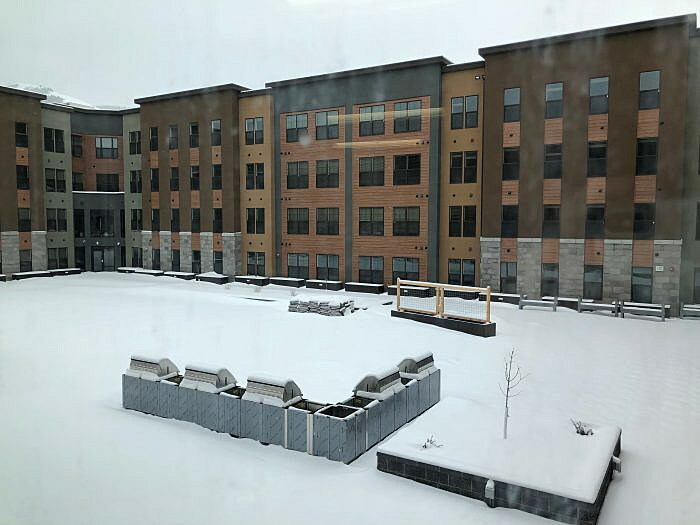 Even with low enrollment at the University of Montana, private developers aren’t worried about keeping new off-campus student apartment complexes full, even as The Sawyer, a student housing development in the Old Sawmill District, opens later this spring. Sandy Curtis, director of housing at the University of Montana, said there are plenty of students to go around, adding that rates at on-campus residence halls and apartments are below market value, which makes UM Housing a viable option for students. There’s also the added convenience (but also cost) of the university’s dining meal plans. It all depends on what students want, Curtis said. “I think some of them will look at what are the most convenient and cost-effective places to live, and I think once students leave the residence halls, we have great options in respect to apartments,” she said. UM Housing offers rooms on campus that vary in price, as well as apartment options at the Lewis & Clark Villages and the University Villages. The University Villages are available for students who are married or have children. Rent at the Lewis & Clark Villages is about $540 per month, including utilities, for a single student. Still, low enrollment has caused UM Housing to close about seven floors in the residence halls on campus and has resulted in an occupancy decline at Lewis & Clark Villages. However, resident occupancy is still at 90 percent at the University Villages. UM offers returning rates for students who wish to live in the residence halls for more than one year, locking them into the rates they paid the previous year. During the 2018-2019 school year, rates increased by 4 percent. For next year, UM Housing is asking the Montana Board of Regents for a smaller rate increase. While the budget is always on her radar, having floors offline results in cost savings, Curtis said. That money can be used toward minor renovations and improvements in the halls. Some improvements included new furniture in the halls, installing large TVs and other technology in study lounges, upgrading laundry facilities and painting the inside of buildings. When UM Housing developed a small master plan five years ago, renovations included remodeling the 11th floors of Aber Hall and Jesse Hall to accomodate large gatherings, adding more laundry facilities and installing high-tech equipment in the study lounges. Even if these renovations aren’t being made now, UM Housing is always looking to improve. Curtis is optimistic that students see campus living as a beneficial and safe option. Jim McLeod, the senior managing director of Farran Realty Partners who overlooks ROAM development, believes that the new administration at UM will be able to increase enrollment. Right now, ROAM is at 65 percent occupancy due to the city’s labor shortage and the building’s construction delays last fall. However, students aren’t the development’s main target, he said. “With regard to the university, we believe that the future is bright there. We believe with the new leadership, enrollment will begin to increase. But when we looked at developing ROAM, we weren’t focused on the university and the decline in enrollment. What we were more focused on is Missoula’s housing problems,” McLeod said. About 57 percent of people living in Missoula are renting their units, with about 34 percent of those people living in multi-family homes, or spaces with four or more rooms, McLeod said. As a result, ROAM is available to everyone, and about 15 percent of residents are not students. Floor plans range from one bedroom units to four bedrooms, and prices range from $550 to $925. Since ROAM’s main target audience is UM’s student body, the company still supports the university’s policy of having freshmen live on campus for their first year. “We support the university’s policy requiring freshmen to live on campus. We believe it provides a solid foundation for students living on their own for the first time,” he said. Kara Hogan, an analyst for Farran Realty Partners, graduated from college a few years ago but lives in ROAM with her dog, Zola. While ROAM offers amenities that are appealing to students, living on campus for at least one year is important. “If you don’t live on campus, you miss out on so much because it’s a necessary part of college and living on your own. You meet so many people and build so many relationships within the university,” she said. The 171,300-square-foot ROAM building has four floors with a total of 164 units that include washers and dryers, kitchens and living rooms. Residents have access to a 24-hour fitness center, secure entry and parking options, and a bike and ski tuning room. The courtyard will also be available to residents in the spring. Residents’ rent includes all utilities except electricity. 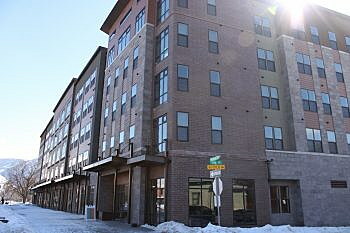 According to an email from Hogan, many residents have renewed their lease. “Right now, we’re really excited about our renewals and the leasing activity we’ve seen so far this year. We are ahead of our leasing number from the last pre-leasing season,” Hogan said. McLeod thinks that the new student housing facilities can help attract students to UM as well, making Missoula’s student housing industry a booming one with hopes of rising enrollment on the horizon. Mari Hall is a reporter for the Missoula Current and can be reached via email at mari.hall@missoulacurrent.com.